Kamehameha I (about 1736–1819) was the first king of Hawaii. Kamehameha was born about 1736, probably during the winter. His parents were Keoua and Keku‘iapoiwa II. They were cousins. Their grandfather was Keawe‘ikekahiali‘iokamoku, who had been the boss (ali‘i nui) of the big island of Hawaii. When Keawe‘ikekahiali‘iokamoku died, there was a civil war. Keoua and his brother Kalani‘opu‘u lost, and Alapa‘inui won. Keoua lived with Alapa‘inui for a while, but he died when Kamehameha was still a little boy. Kamehameha left and lived with his uncle Kalani‘opu‘u. When Kamehameha's uncle died in 1782, his cousin Kiwala‘o became the new boss of the big island of Hawaii. Kamehameha became the head priest for the Hawaiian god of war Kuka‘ilimoku and the leader of the Waipi‘o Valley. He and his cousin started to fight because Kamehameha showed more respect to the gods than to his cousin. Some leaders in Kona joined him. They beat Kiwala‘o at the Battle of Moku‘ohai, and Kamehameha became the leader of Kona, Kohala, and Hamakua on Hawaii Island. At that time, there were people who said that they could see the future. They told a prophecy that Kamehameha would bring Hawaii together and even unite the people of Polynesia as far away as the Maoris in New Zealand. Kamehameha began to plan to unite all the kingdoms of the different islands. He started buying guns and bullets from British and American sailors who came to Hawaii while they hunted whales. Captain Brown began to bring him gunpowder from China and taught him how to it from sulfur, saltpeter, and charcoal on Hawaii. Isaac Davis and John Young stayed on Hawaii, married Hawaiian women, and taught Kamehameha's men how to use and fix guns. Kamehameha took Puna from its leader Keawema‘uhili in 1790. Keoua Ku‘ahu‘ula tried to take over his land while he was busy fighting, but Kamehameha was able to come back with his men in time. Keoua Ku‘ahu‘ula ran away past the volcano Kilauea and lost many men because of poison gas. The next year, Kamehameha invited him to visit. When Keoua Ku‘ahu‘ula came, he and his protectors were all killed. Kamehameha was now the boss of the big island of Hawaii. Kamehameha now had 960 war canoes and about 10,000 men. He took Maui and Molokai at the Battle of Kawela in 1795. Kamehameha then attacked Oahu, landing his men at Wai‘alae and Waikiki. His helper Ka‘iana was really helping his enemy Kalanikupule. He helped make special safe places for Kalanikupule's cannon on top of the Pali Mountains. This caused Kamehameha to lose many men until he sent many to climb the other side of the mountains and hit the cannon from behind. 400 Oahu men were forced over the side of the mountains' 1,000 ft (300 m) cliff. Ka‘iana was killed in the battle, and Kalanikupule was caught and given as a gift to the war god Kuka‘ilimoku. Kamehameha got Kaumuali‘i, the leader of Kauai, to work for him in April 1810 and, in this way, at last became the only leader of all the Hawaiian Islands. Other angry leaders wanted to kill Kaumuali‘i with poison at a big dinner but Isaac Davis heard about their plan and told him ahead of time. Kamehameha made Kamakahonu in Kona his home after about 1812. He wanted the Hawaiian Islands to stay together after he died. He made all the islands use the same laws. He used his taxes to increase the islands' trade with Europe and the United States. He thought about bringing in Christianity to the islands, but decided that the Hawaiian gods that he had followed so far were strong in spirit and had brought him his success. He had somewhere between 20 and 30 wives and about 35 children, including 17 sons and 18 daughters. 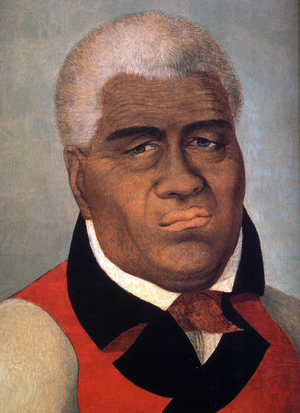 Kamehameha died on May 8 or 14, 1819. No one is sure where his body was put, because the Hawaiians thought people could use the spiritual power of the dead and the king's close friends Hoapili and Ho‘olulu hid his body carefully. His children by his wife Keopuolani followed him as the leaders of Hawaii and are known as the House of Kamehameha. This page was last changed on 15 November 2017, at 01:38.